Opening day of the Bridge project last fall. I’ve collected oodles of data on this project where I’m studying women’s experiences in engineering education across Europe, and I admit it’s been a fierce new challenge for me to manage all the data and use it effectively. Last week alone, I conducted three new 60-90 minute interviews that will need to be transcribed, read and reread and reread, coded and analyzed in concert with others. I’ve had quite a bit of help getting as far with this project as I am–having completed 47 initial interviews in three countries (Ireland, Poland, and Portugal) and about 15 follow-up interviews (in Ireland) to date. Two of the teachers for DIT’s bridge project. Many thanks go to Allison Wagner, who did a two-month internship with me last spring, for her help conducting and transcribing five of the follow-up interviews with Middle Eastern women. Additional thanks go to Bill Williams and Raquel Barreira for their help with the Portuguese interviews, as well as to Tais Carvalho, Ivan Garcia, and Michael Carr who assisted with translation. In addition to this, my past PhD supervisor, Pam Eddy, is (still today, seven years post-PhD) always ready and willing to offer astute advice and for that I am extremely grateful. DIT’s Brian Bowe was instrumental in early work on this project, and my colleagues at DIT have provided insight and enthusiasm on a daily basis—most recently Ted Burke and Claire McBride. It’s a lot of work and a big team effort, but it has its benefits. What I am learning directly improves my teaching and it also helps me advise my colleagues, with whom I often discuss teaching strategies. On other fronts, I have a long way to go. Although I’ve presented findings to policy makers and researchers, I still struggle to finalize manuscripts for publication. This is a focus on my current fellowship at UCL–developing proficiency in publishing. I have made really swift progress though, and I look forward to showing you some results soon! Recruiting women for Science, Technology, Engineering and Maths: Sheryl Sorby at TEDxFulbrightDublin. Dr. Sheryl Sorby‘s groundbreaking research on spatial visualization brought awareness of spatial reasoning to engineering education worldwide. Sheryl’s work highlights the importance of educational research and illustrates how applied research can make a real difference in the way we learn and teach. Sheryl is a pioneer in engineering education research — the area where I’m now working to establish myself. She was doing this type of research long before Engineering Education Research (EER) was recognized as a distinct field of study. As such, she helped pave the way for all of us who are working to understand how people learn engineering and design today. Today, she’s actively leading research teams on this topic. Last year, Sheryl served as Ireland’s Fulbright Scholar in Engineering Education (that’s the post I held the year before) and she made noteworthy contributions. Whereas I applied for the Fulbright position when I was a “baby doc” (straight out of grad school), Sheryl brought the wealth of experience of a professor emerita (which essentially means she retired with academic kudos). Awards she has received include the 2011 Sharon Keillor Award for Women in Engineering Education bestowed by the American Society for Engineering Education (ASEE). The National Science Foundation has supported many of her projects, and she even worked (or, “did a rotation”) at the NSF headquarters, as Program Director in NSF’s Division of Undergraduate Education. I’m proud to walk in Sheryl’s footsteps, and thankful for the work she’s done! 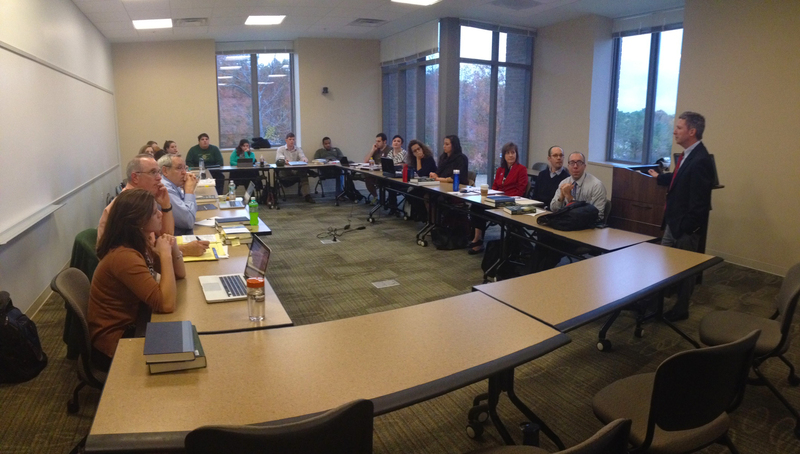 The class on Student Development Theory at The College of William and Mary. I visited alma mater last night, The College of William and Mary, to speak about cognitive development theories developed by William Perry, Marcia Baxter Magolda, King and Kitchener, and the like. I was asked to highlight how I incorporate these theories in my research and teaching. This was an optimal time to give such a talk, because I’m gearing up to conduct a phenomenological study of students’ experiences of collaborative, trans-disciplinary, problem-based learning. Last night’s talk got my mind moving in that direction. The people in the picture above are working on graduate degrees in Higher Education; several of them shared ideas and recommendations for the design of my proposed project. At least two of them are using phenomenological methods for their dissertation work. Their enthusiasm for my plan raised my own energy level and got me psyched to start work. I’d had some nagging questions about how to best protect my research participants (i.e., “subjects”); the W&M students helped address my concerns. I’d also had difficulty making time for this project because of its sheer scale. I was trying to do too much at once. I devised a workable plan during my drive to Williamsburg and got good response to my idea. In essence, I’m now following the rule that if you want to eat an elephant, you’ve got to proceed one bite at a time…. I’d been completely overwhelmed by trying to analyze data from 30+ participants. So, I’ve determined to focus in on one group. I can extend the work over time, but a group of six is appropriate for a phenomenological study (and a more reasonable way to digest this elephant). So, I’ll look closely at one group of six students who worked together as a team with impressive results. Each of these students documented the team’s design process in writing across the course of a semester. I’ve already done quite a bit of analysis on what they wrote, and that allowed me to make a purposeful selection. In this case, I know that more than one team member experienced powerful (pivotal or seminal) instances of learning. I want to find out what factors caused those changes. I’ll be looking at how the six team members experienced the collaborative design process in the period leading up to significant “a ha” moments. I hope that the results will help educators (including me) prompt that type of “deep learning” more often. I can extend the work to look at other groups later. And, as Dr. Jim Barber (the instructor of record for last night’s course) pointed out, I can also extend the study in the future (to make it “longitudinal”) by tracking down members of the group and conducting follow-up interviews. I always enjoy visiting the W&M School of Education and yesterday was no exception. After arriving at the School of Education’s brand new LEED-Gold building, I admired the fall colors and gabbed with a former classmate (Sharon Stone) and my mentor (Dr. Pam Eddy) before heading into Dr. Barber’s class. …to house the School of Education. Its LEED-certified building is surrounded by rain gardens to filter and control storm water run off.